Living room, second floor. Original artwork throughout home. Our home is available for one week, from Fri, 8/9-Fri, 8/16/19! Up to 3 additional days can be made available on 8/6, 8/7, and 8/8 if renting the week of 8/9. See details under Calendar and Pricing. 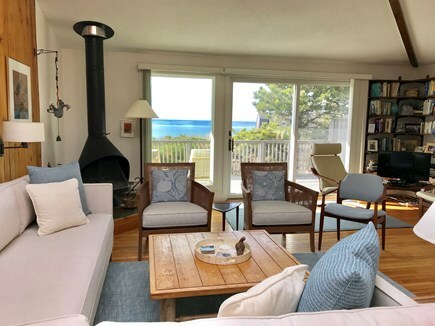 Our 4-bedroom, 2-bath home, located in a private residential development, offers beautiful water views of Cape Cod Bay and is a 5-minute walk to a spectacular and private, uncrowded beach. The beauty of the natural surroundings specific to Truro can be seen from every window of our house. The home has always been in our family, and three generations have enjoyed and lovingly cared for it. 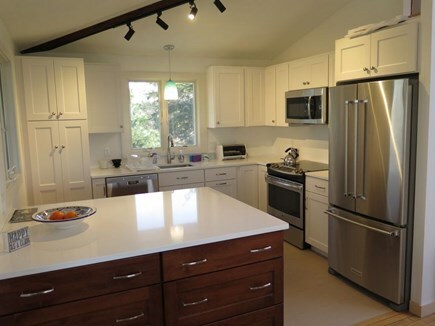 The kitchen is newly renovated with stainless steel appliances and quartz counter tops. Other recent updates include all new windows and exterior doors, new skylight, new cedar shingles, new roof, and interior renovation, painting, and furnishings so we are willing to share with other caring, responsible families on a limited basis. Please see the calendar and listing of specific weeks below for availability. Being an ''upside down'' house, the second floor offers a great room which combines living, sitting, and dining areas with views of the bay. 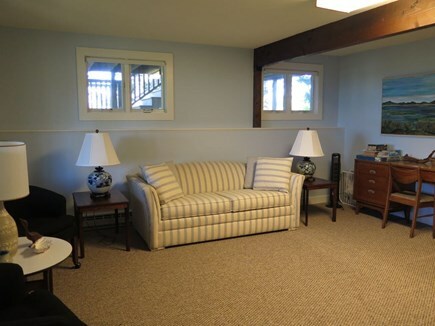 This room has a vaulted ceiling with a large skylight which allows light and sun in all day. Off this room is a kitchen as well as a master bedroom, single bedroom, and full bath with shower. The kitchen comes fully-equipped. Three sliding doors off the great room and master bedroom provide access to a large wrap-around deck with seating and outside table and chairs for dining. 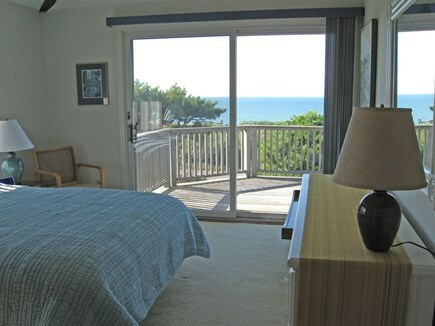 A gentle breeze off the ocean can be felt throughout the great room and bedrooms during day and evening. On the first floor are two additional bedrooms, full bath with bathtub and shower, a second living room area, and a laundry/utility room. In the back of the house, there is a large outdoor shower as well as separate room to store bicycles. 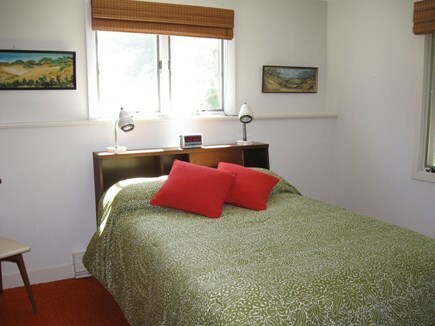 The house has capacity to sleep up to 7 people in four separate sleeping areas. 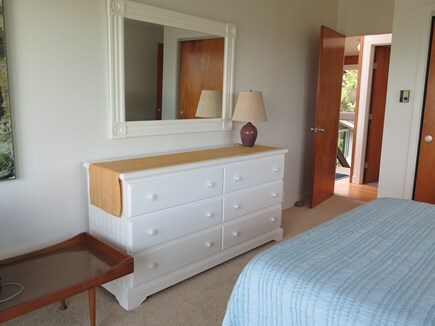 We ask that you provide your own linens, personal and beach towels, or we can provide you with information to a local linen and towel rental supplier. We offer high speed internet, WIFI, new 32 inch flat screen cable TV, and DVD, new dishwasher, new washer & dryer, a Weber charcoal grill, and a large outdoor shower. NO smoking, NO pets, NO exceptions. 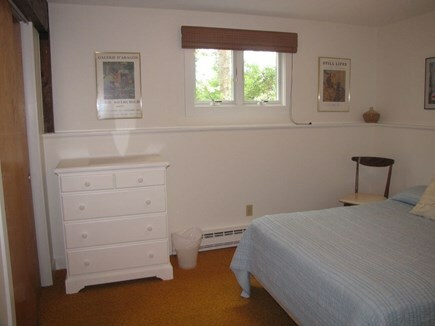 The home is well maintained and very clean, and is a happy place to vacation in. It is uniquely located in an area of the Cape that is surrounded by the Cape Cod National Seashore with natural seascape settings, a variety of nature walks, and dune views. 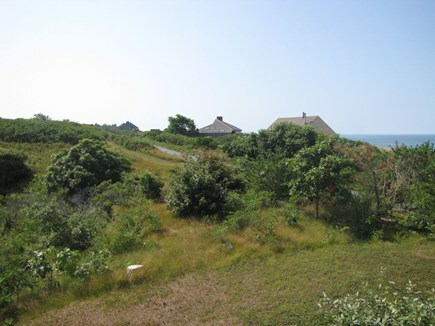 There is conservation land on the beachfront property across the street from the house, owned by our family, with a walkway leading out to a deck area. 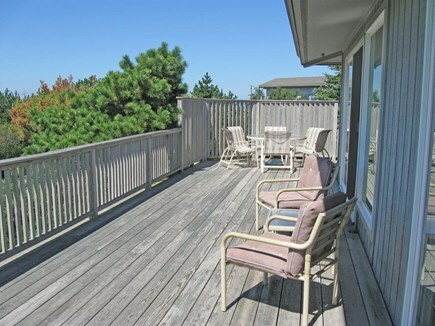 This deck area can be used for quiet sitting and conversation, reading, and enjoying the expansive views of Cape Cod bay. 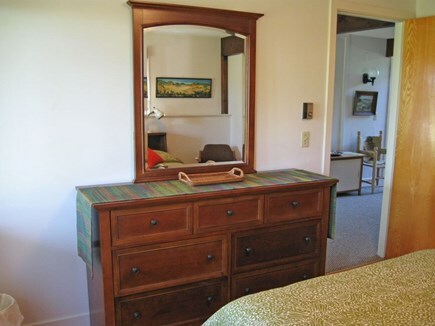 Our home/location offers a great combination of privacy and tranquility yet is surrounded by the more active communities of Provincetown and Wellfleet, which are minutes away with their outstanding restaurants, shops, and art galleries. Local fish markets, shops with fresh produce, homemade breads, and homemade ice cream are nearby. At our home, you will find an updated list of our favorite restaurants in various price ranges and local markets as well as suggested nature walks or day excursions. Additional pricing info: Up to 3 addit'l days, negotiable at $700/day, on 8/6, 8/7, & 8/8 if renting wk of 8/9/19, State and local taxes of 12.45% will apply. This is our third year in a row staying at this fabulous spot. It has everything - great location, amazing views, fabulous beach, super comfortable house. The homeowners obviously take great pride in the property - there seems to be an improvement every year! Last year it was a new kitchen that is a joy to cook in. The view when you are prepping is fantastic. This year there is a new LR sectional and chairs that are not yet shown in the photos. Very serene, casual and comfortable. 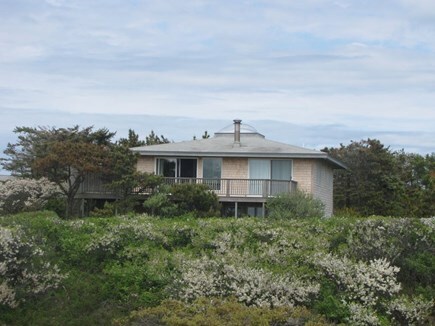 My family and friends loved staying at this beautiful home in North Truro. The location was wonderful for all of us. The house was on a street with very little traffic and was developed within the spirit of the environment. 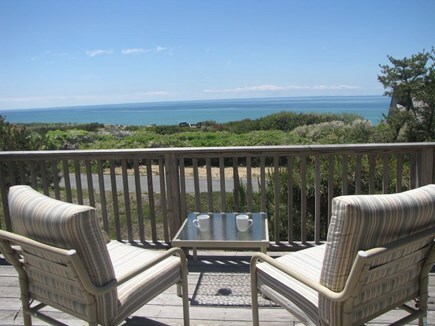 An entry with stairs to the bay beach is only three minutes from the house (easy for children and elders to manage), sunsets can be seen from the deck, and one of the most breathtaking ocean beaches, Head of the Meadow, is only a 5-minute drive away. 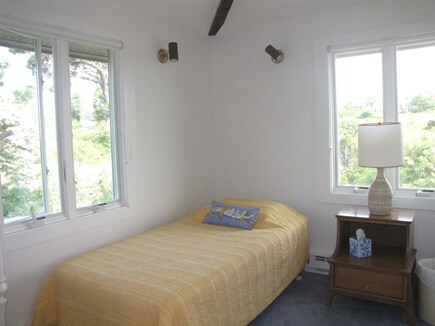 It is the very best location that we experienced in our many years of renting in the Wellfleet/Truro area. The views are spectacular from the house and from the small platform across the street on the bay, which my friend was able to access in a wheelchair. My husband, who swims in many waters, says the swimming on the bay beach is the best he has ever done. This impeccably maintained home has a new and well-equipped kitchen. The functional design of the house includes two bedrooms, playroom/living room, and bath on first floor, with entries out to the back and front yards, and an open concept living, dining and kitchen area with master BR, single BR and bathroom on second floor. Delightful artwork adds to the lightness and open feeling of this special home. The owners were very accommodating to our needs, and communication was excellent, which included a book of details on the house and local restaurants and places to visit. What else could one want or need for a vacation with family and friends? This is a great place. My family and I have vacationed on the Cape for many years. This is the first place we ever rented where we did not feel we had to go anywhere to enjoy our stay. Very comfortable to just hang out at 'home', or amble to the beach carrying only a chair, or enjoy the deck, or bench out back, or wonderful seating spot in their lot across the street. I like to cook. I actually look forward to the cooking part of my vacation days. Really great experience with that here. It was great to be working away in the kitchen and to have that spectacular view of Cape Cod Bay. The kitchen allowed the ‘cook’ to be in the middle of things, in a bright breezy place, with great views and the ocean. Happy happy. It is well-equipped and laid out. We had wonderful family dinners and breakfasts around a very special dining table. There were familiar amenities like baskets for fruit, coasters for drinking glasses, and trivets for hot cookware. And again, the view was spectacular and the dining space open, with lots of sunlight and ocean breezes. The living spaces were great - everyone was comfortable with good privacy and space for everyone. Wonderful to have a dish washer, clothes washer and dryer. The host had prepared instructions for all the appliances and also the location of everything we needed. From pots and pans, to trash bags, to instructions for the oven; everything was well laid out and easy to find. The host was also very responsive and thoughtful regarding questions we had. Great place. Great experience. We hope to return!! The house is very comfortable and well cared for. The view is amazing! It is located on a quiet dead end street, where you can walk a few steps to the beach access and a wonderful swimming and walking beach. We rode our bikes to Provincetown in about 25 minutes, very pretty once you get on 6A. 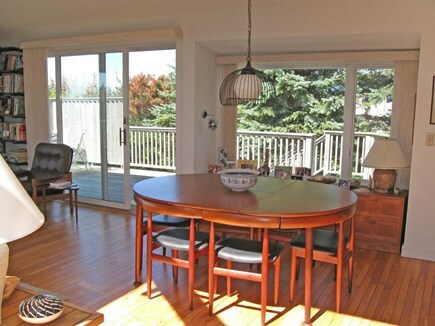 The living space on the second floor is open and bright with ocean views all along the front. The house has everything you need for your stay. The kitchen is well equipped and I hear to be completely renovated by next summer - even better! We have been lucky enough to stay twice and would highly recommend it. The homeowners are lovely and quick to respond to any requests. A wonderful get away! 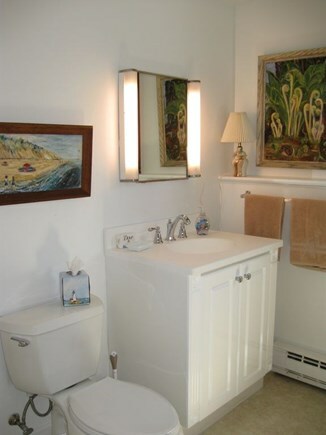 Wonderful, well maintained, updated family home in a pristine, quiet ocean-side location. 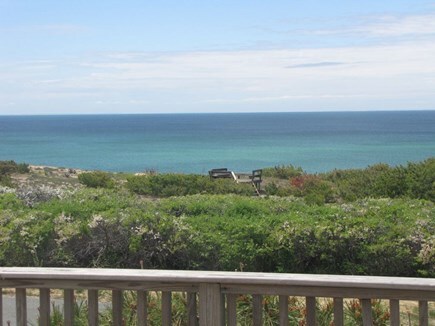 Spectacular views of Cape Cod Bay with a 2 minute walk to the steps of your lovely private beach on the bay. 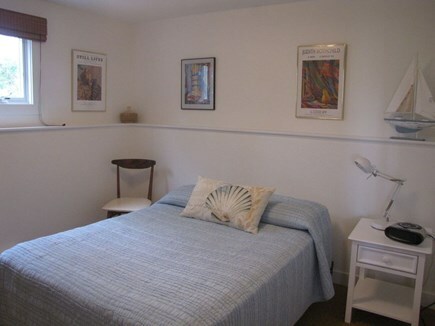 This home is very well equipped with all expected rental amenities, comfortable furnishings and beds, artistic accents and pride of ownership. The owners are very involved in insuring a pleasant, hassle free vacation, and Terry is a complete resource for local cuisine/restaurants/shopping. 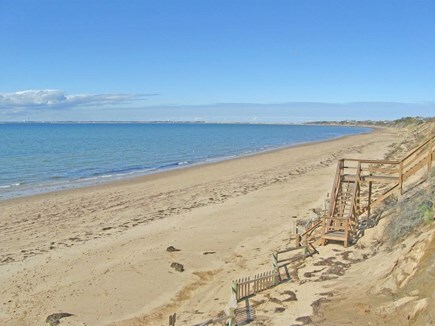 Multiple ocean beaches within 10-20 minute drive (seals included) and P-town is 20 minutes away with shops, restaurants, New England Cape architecture and its own special flair! The kitchen is small but functional (soon to be updated), living area can accommodate 8-10 comfortably, lower level has 2 bedrooms, bathroom and large living area that can be closed off for an additional bedroom. Lots of stuff for the beach with chairs, boogie boards, etc. Extra pillows and comforters as needed. Steps to the beach are multiple and moderately steep, not handicap accessible. Water temperature in Cape Cod Bay and the ocean is cold compared to the beaches in Falmouth/Hyannis. However, this area of the Cape is much less developed and filled with classic Cape character. 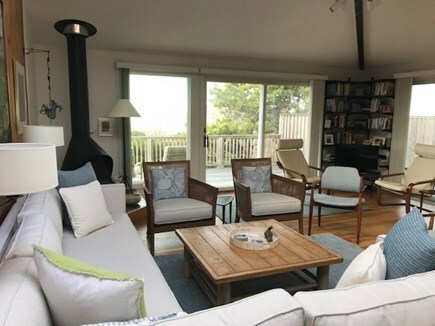 This house is perfectly located, in a private community with an unobstructed view of the bay, sunsets, and the lights of Provincetown at night, and just a few steps from the access to the beautiful and totally uncrowded bay beach. 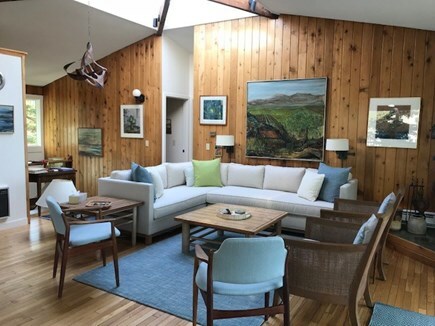 It is close enough to Provincetown to make that an easy destination for a meal or a stroll, while still being close to Wellfleet and Truro when you want fewer crowds.